Vietnamese people tend to be conservative when it comes to public displays of affection. You’ll almost never see a couple openly kissing, but there are certain romantic spots around Hanoi where you’ll see some hand-holding and heads leaned on shoulders — places where they watch sunsets and talk about the future. There’s something about these places that brings out the hidden romantic in people. Hanoi has many beautiful locations, but here are the places where romance blooms. 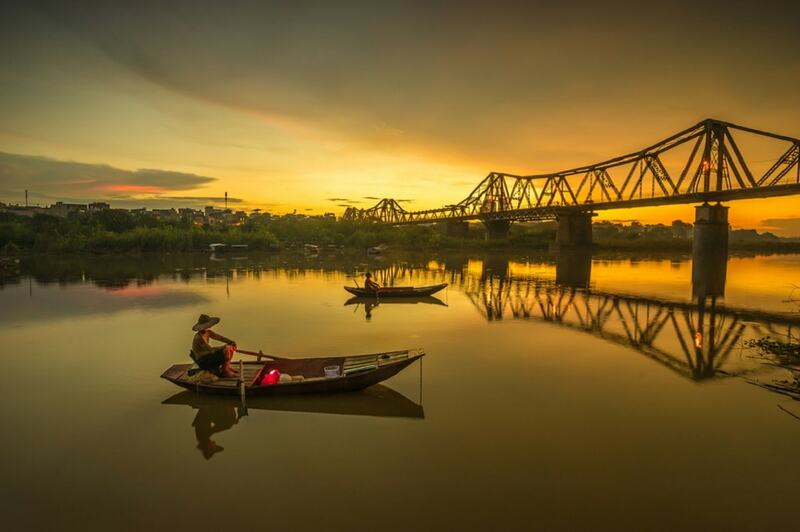 Every night, couples ride their motorbikes to the famous Long Bien Bridge to spend precious time with each other after long days of study and work. It’s a cost-effective romantic retreat, but keep an eye out for the traffic cruising by. Vietnamese commuters have no patience for idle lovers. There are many romantic restaurants in Hanoi, but here’s one we’re sure you’ll love. The Gourmet Corner Restaurant is located on the top floor of the Elegance Diamond Hotel, and it has some of the best views of Hanoi. You can see Hoan Kiem Lake, the Old Quarter, and most of downtown. Couples packages make for the perfect accompaniment to any date. Let the scents of flowers and oils bring a calm over you as the relaxing music vibrates through the air and well-trained masseuses knead you into a state of bliss. Since it’s right around the corner from the Gourmet Corner Restaurant, you could pair them up for a romantic evening on the town. Although the Old Quarter is fairly hectic, it’s also a lovely place to just stroll around and take in all the sights. We recommend you share a cyclo so you can bond over intimate moments as you move through historic scenery. The Tay Ho District is a booming area around the largest freshwater lake in Hanoi. Locals come to the area for a reprieve from the crowded downtown area. Lovers have several options, but one of the most popular is to rent a swan paddle boat and drift aimlessly as you chat about whatever your heart so desires. Afterwards, check out the sunset bar for spectacular views of the lake.